Occasionally, a game is created that joins together the best of multiple franchises, such as with the "Marvel Vs. Capcom" fighting game series, "Mario and Sonic at the Olympic Games," and the unusual "Mario + Rabbids Kingdom Battle." 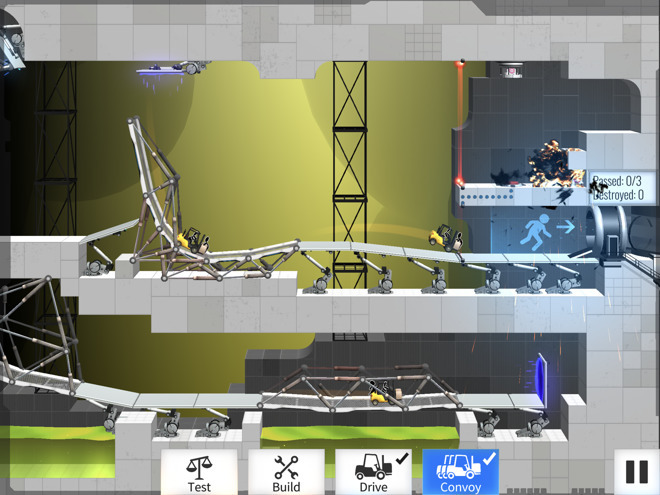 Most of the time it's obvious how the two different franchises could work together in a single game, but in the case of "Bridge Constructor Portal," sometimes it involves the combination of wildly different gaming universes. At its core, "Bridge Constructor Portal" is a familiar title to players of "Bridge Constructor," a game series where players have to create a structure capable of allowing vehicles to get from point A to point B by crossing a chasm. Each level presents the player with different challenges, such as varying terrain and anchor points that the bridge can be built from, with the difficulty gradually increasing between puzzles. Building the bridge involves laying down support struts and cables in a pattern to best take the weight of the road, as well as any vehicles that will be making the crossing. Poorly chosen designs can place too much stress on a cable or girder, causing part or all of the bridge to collapse, stopping the car from getting to the other side of the river in safety. "Bridge Constructor" has so far proven itself to be a popular franchise in its own right, with multiple installments of the game available to buy from the App Store and played by over 50 million players around the world. Even so, it is likely that publisher Headup Games and developer ClockStone wanted to take the formula in a new direction and to expand its horizons, prompting the unusual partnership with "Portal" creator Valve Software. In this latest version of the game, "Bridge Constructor Portal" applies the same gameplay found in "Bridge Constructor" but reimagined it to take part in the Aperture Science test laboratory. 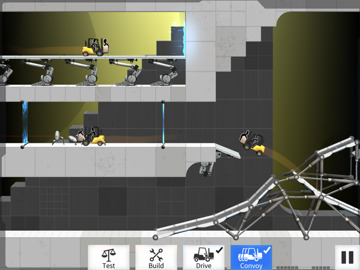 Despite the new surroundings, it still revolves around players putting together bridges in levels that will let forklifts driven by Portal's stick people get to the exit. The change of scenery brings with it new challenges well known to "Portal" players, including the titular portals, which transports objects passing through one entrance through another with the same velocity as entry. 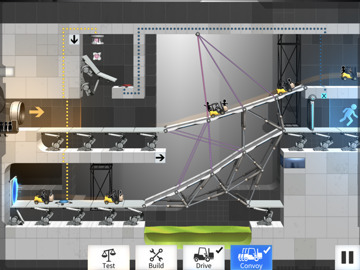 Depending on the placement of each end of the connected portals, this could mean a change of orientation of the forklift that players have to take into account. In some cases, this could mean building a ramp that steers the forklift into the portal at high enough speed so it shoots out of the other portal entrance to clear a gap or a wall. Other trappings from the "Portal" universe also appear as obstacles or elements that are needed to complete a level. Aerial faith plates act as mechanical springboards that fling the forklifts in a specific arc, while the vocal sentry turrets will shoot at the vehicle on sight, unless they can be dispatched before that occurs. Gels, which first arrived in "Portal 2," coat bits of the room in some puzzles, with the propulsion gel speeding up the forklift and the repulsion gel bouncing it into the air. Bouncing balls of energy can be used to power level elements, but are also able to destroy the forklift, in a similar way to the stationary laser barriers. Lastly, the fan-favorite companion cube makes an appearance, used to trigger buttons and to clear the way with kinetic energy. The added elements bring new life to the bridge-building concept, adding more things for players to contend with in each level. A typical level revolves around performing multiple tasks to get around each obstacle, sometimes in a specific order, taking advantage of each item's properties in the process. Just one forklift is required to traverse the bridge to complete the level, a task that doesn't necessarily require the bridge itself to be sturdily built or to even remain standing after the crossing has completed. 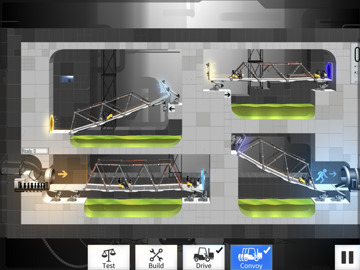 For an extra challenge, the game offers the opportunity to have a convoy of forklifts make the crossing, which typically results in fortifying the bridge to take the extra strain of multiple vehicles at once. There are 60 puzzling levels in the game, which is a decent amount considering how long later bridges can take to construct successfully. Initial levels gradually teach players new concepts that they will need to know for future areas, though the game does also provide extra assistance to those new to the genre with a selection of general guidelines to optimal bridge building. There is some amount of replayability once the main campaign is completed, with perfectionists able to rebuild previous efforts as cheaply or as efficiently as possible, minimizing the amount of materials used for each construction. There are also a number of achievements to obtain, ranging from completing chapters and successfully handling convoys to tougher tasks. Some will take time to accomplish, such as accumulating 5,000 portal transitions, while the challenge of bouncing the vehicle 25 times on repulsion gel will require some creative thinking. 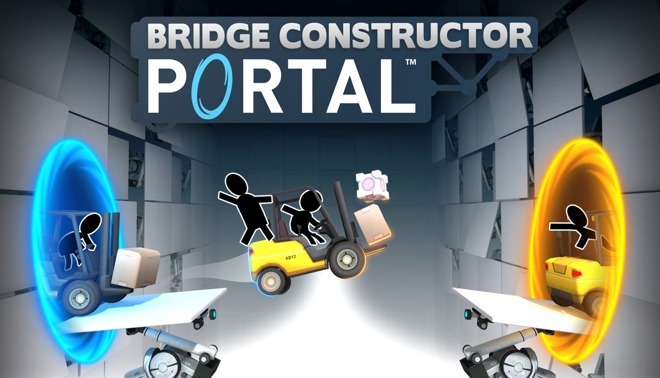 While it could easily have been a simple graphical change to the original game, a lot of work has gone into making the appearance of "Bridge Constructor Portal" match the aesthetic of "Portal" itself. The levels and the stick figures look just like the imagery used in Valve's games in tutorials and other areas, with the user interface also matching the theme of Portal's menus. Throughout the game is the voice of GLaDOS, voiced by Ellen McLain, the same voice actor behind the character in the "Portal" games. 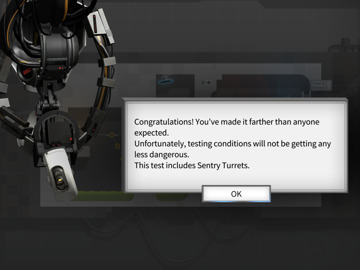 GLaDOS introduces the player to the game and appears in regular intervals to warn of new elements and to offer "inspiration" as the levels march on, complete with the humor the "Portal" franchise is known for using. In the levels themselves, the layout of the interface is easy to understand, with the Test, Build, and Drive view options at the bottom and the building materials to the side. The pinch-to-zoom gesture is essential for looking closely at sections of each level, which helps when making small adjustments to the bridge. The act of placing and adjusting structures is helped by the great design decision to locate the cursor dot just above the user's finger, instead of directly beneath. This makes it considerably easier to fine tune the structure on an iPad, as the exact placement is visible to the player at all times, minimizing mistaken placements that could occur if the dot is below the fingertip. 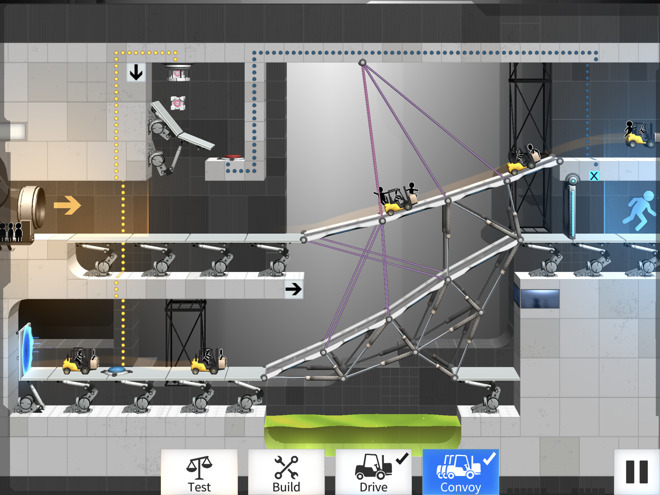 "Bridge Constructor Portal" is a marriage of two franchises that, when looked at subjectively, no-one would have really thought would take place. One is a puzzle game about structural design and tension management, while the other is a first person puzzler about escaping a maniacal artificial intelligence. An unlikely pairing that, thanks to the high quality execution by HeadUp and ClockStone, work extremely well together. 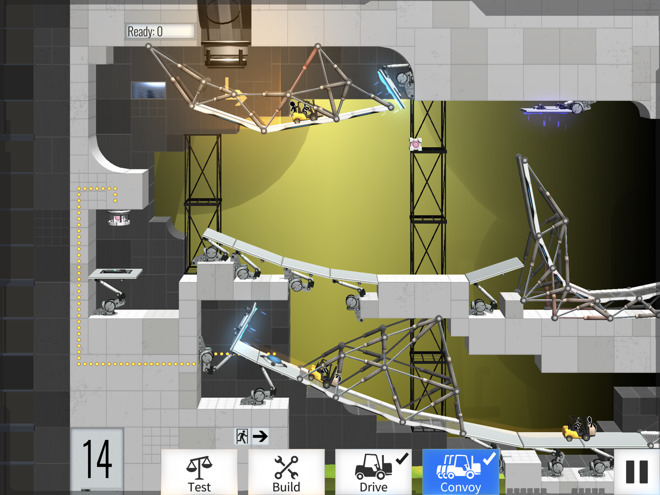 While it probably won't set the gaming world on fire, fans of both "Portal" and "Bridge Constructor" will find a lot to like from "Bridge Constructor Portal." Fans of the former will most likely enjoy seeing a new game based in a beloved gaming universe, while "Bridge Constructor" players will most likely enjoy the additional elements to the gameplay they already enjoy. "Bridge Constructor Portal" will be released on the App Store on December 20, priced at $4.99. The download requires 154 megabytes of storage and is compatible with the iPhone 5s, iPad Air, iPad Pro, 6th generation iPod Touch and newer devices running iOS 8.0 or later. The macOS release will also be available through Steam from the same date, priced at $9.99. According to the Steam sales page, it requires a Mac with a 2 gigahertz processor, 2 gigabytes of RAM, and 200 megabytes of available space, running macOS 10.11 or later.